 I'm mildly sad that this series is coming to a close - mainly because I've enjoyed hearing your stories about your own closet clean outs, vision board creating, and finding pieces that really work for you. But I'm excited to knock this one off my 30 Before 30 list and move on to the next big project. The best thing you can do for your sanity is have a clean, well organized closet. Why? It's impossible to see if you already own a pair of black skinny jeans if you haven't seen them in so long you can't remember, because they're crumpled up after falling off the hanger in the back of your closet. Knowing what you already have is essential before you shop. I once ripped a hole in a very expensive cashmere sweater when it came in contact with a high heel after being tossed on my closet floor. I know, I know. This is incredibly immature of me, but admit it - something like this has happened to you. Or maybe you didn't hang up that dry clean only silk top after you came in from a night out with friends, and now it needs to be dry cleaned again, even though it's not dirty. Not taking care of your clothes costs more money. And wouldn't you rather spend that on a great new bag? When everything is put away and easily seen, you'll make your choices that much faster. You get an extra fifteen minutes of sleep in the morning, you can linger longer in the shower, and be out the door much less frazzled than you would be if you were searching for the black tights instead of the navy. 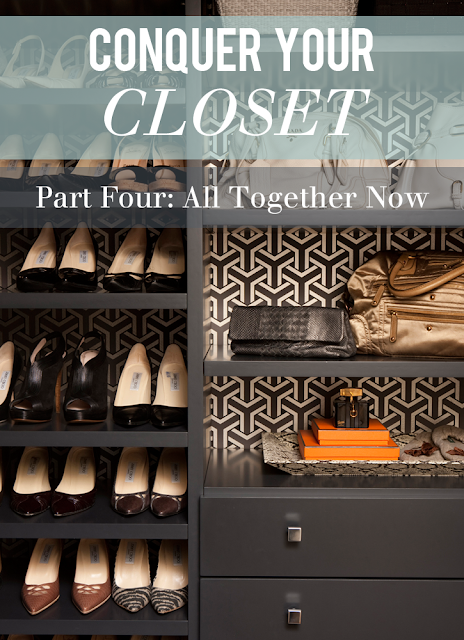 Want to see photos of my own closet, and get some tips on how to organize yours? This is my closet. It is not huge. You do not need tons of space to be well organized. Back when I was a bachelorette and living alone, I bought two large and two small Ikea PAX wardrobes because my apartment literally had no closets. Thank goodness we hauled them all the way to San Francisco, because we have what amounts to a coat closet in our bedroom here. But when I moved in with Melvin, I had to split my share of the wardrobe in half. At first, this was mildly traumatic. Eventually, I decided to approach it with a "less is more" attitude. As it turns out, I really don't miss nor can I even specifically remember what it was I got rid of. If you've completed The Big Purge - you should have no trouble fitting everything you own into your closet. If you do, you haven't done it correctly. Cocktail and special occasion clothing is stored in a garment bag in our coat closet. I don't wear it daily, so I don't need to see it daily. Shoes and heavier jackets are also stored in this coat closet. I wish I had room here so it was all in one place and I didn't have to go all over the apartment for things, but that's our reality and I try to make it work in the best way possible. Now, let's talk about yours. Pull everything back out. I know you did this once already when you cleaned things out, but do it again. You've already evaluated, this is just a matter of seeing how much space you have and figuring out how to put it back in. Evaluate the space that remains. Can you move a bar? Add a shelf? Push a dresser into an empty space to add closed storage? Would space saving hangers give you extra room? Only put back in what you wear on a daily basis. Consider placing things in storage boxes, garment bags, or under the bed if you don't need it often. Your closet should be pieces that work on a daily basis with your life. Start with the clothing, placing like with like. I prefer to group all of my long sleeved items (which is the majority of my closet here) together, then all of the tank tops and short sleeves together. Once that's done, organize by color. When you're trying to pull together an outfit, being able to access all of your options in a neutral or specific color is helpful. For me, I use this acronym - WROYGBVBGB. Like the rainbow, but edited and expanded. White/Ivory, Pink/Red, Orange/Peach/Coral, Yellow, Green, Blue, Violet/Purple, Brown, Grey, Black. Now that the clothes are in place, start adding in the extras - folded items (jeans + sweaters), jewelry, handbags (stuffed with acid free tissue and stored in their original dustbags), and belts. 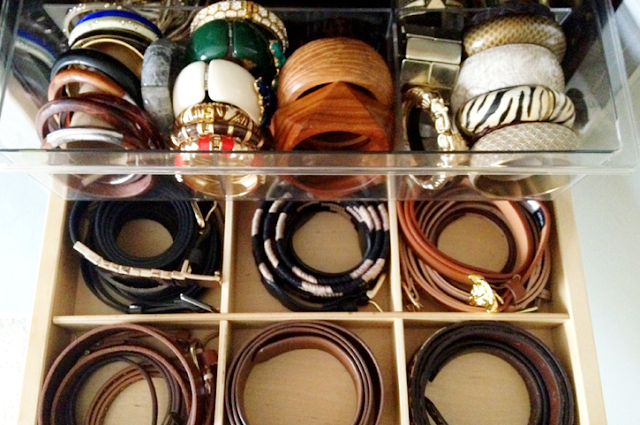 I love to use these jewelry display trays with appropriate liners to keep everything protected and easy to see. 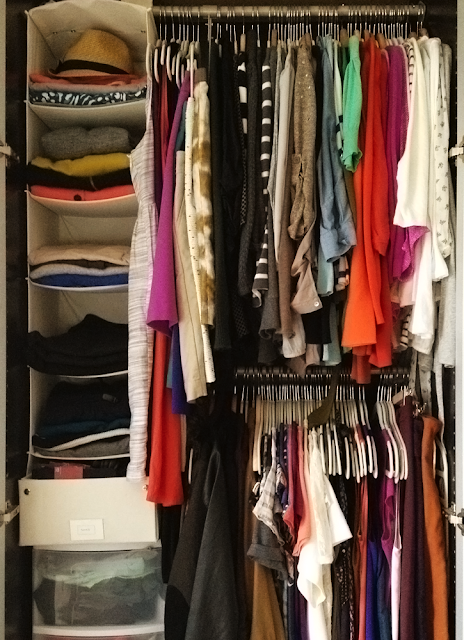 What's your best closet organization tip? How do you organize things to meet your daily needs? Thanks for the Gems on Display shout out! I love seeing how our products are being used in every day life. 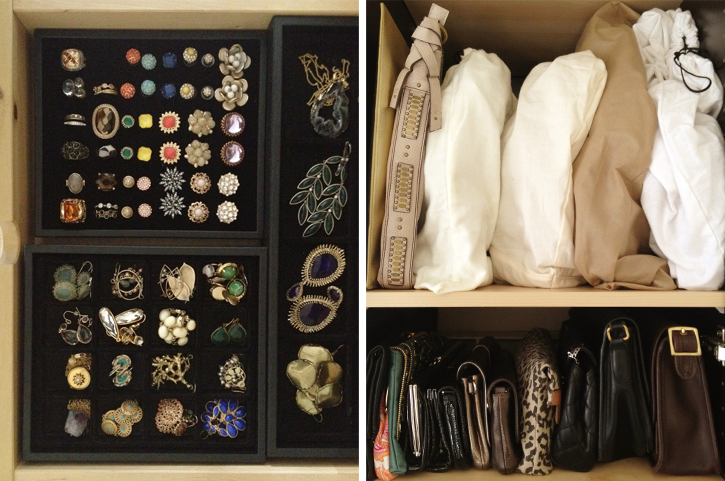 And I'm definitely feeling inspired for getting my own closet organized! Hi Tricia! You're very welcome! I've had my trays for years and they're still in fantastic shape.